[Ramadan Series] The Night of Power: Do Not Miss! Indeed, Laylatul-Qadr (the Night of Power) is a glorious and honorable night that is so grand, it’s beyond our comprehension. It was on this night that the Qur’an was first revealed to Rasullulah by the greatest of all angels, Angel Jibril. It is a night filled with importance and rahma (mercy), one that we should reflect upon. This one majestic night ALONE is superior to the equivalent of 83 years and four months of worship. The scholars have further defined this to be not just regular worship – but continuous worship of the highest-quality over 1000 months. Laylatul-Qadr, in that one special night, is MORE worthy of blessings from Allah than the blessings you would receive if you were to accomplish the above. Subhanallah! Laylatul-Qadr is the opportunity to earn a lifetime of rewards in just ONE night. Think about that! Throughout this blessed night, the Malaikaat (Angels) will descend and fill the sky. There will be a constant flow of Angels coming to give their salams and immediately leaving. In other words, Angels will be coming and going throughout the night delivering salams upon those who are worshipping. It is the nature of the Angels to love those who perform Ibadaat and turn to Allah in repentance. They love those who praise and glorify Allah. They seek out those who perform such acts and pray for them. Angel Jibrail will also be one of those Angels that will descend on this night. The very same Angel that was blessed to carry the wahi (revelation) to our messengers, including Rasullulah . How amazing is such a night, to be in the presence of such an Angel! One of the signs of Laylatul-Qadr is that on the morning after that night, the sun will be bright and clear, but the rays of the sunlight will not be as visible. It is said that because of the wings of the Angels on that morning, the rays of the sunlight will be blocked. Here are some recommendations on how to make the most out of your search for Laylatul-Qadr. 1. I’tikaaf – This was a practice of Rasullulah . Abdullah bin Umar narrated that Rasullulah used to practise Itikaf in the last ten days of the month of Ramadan [Bukhari]. Dedicate the last ten days and nights of Ramadan to the worship of your Creator, Al-Khalaq. Spend the time performing dhikr, reading Qur’an, praying supererogatory prayers, tahajjud, etc. If you can’t devote the full 10 days and nights, it’s encouraged that you do what you can, even if it’s a night or two. 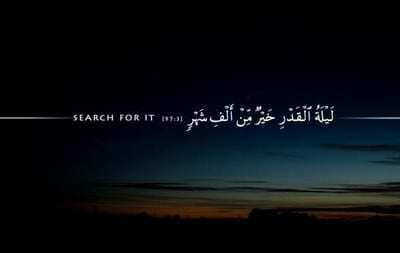 Take some time and brainstorm all the things you would like to ask from Allah ‎ in your du’a. Include anything and everything, whether it be things in this dunyaor in the akhira. Don’t feel shy, as Allah is Ar-Razzaq (the One Who Provides your Sustenance), Ar-Rahman (the Most Merciful) and Al-Wali(the One Who Protects you the Most). Allah ‎ loves for His servants to supplicate and ask for their desires to be met. He is Al-Ghani (the Rich), and His Provisions do not diminish by answering the du’as of His servant. In fact, it is out of the arrogance of us if we do not seek Allah’s guidance, mercy and provisions by supplicating in du’a. Now with this exhaustive list of things you would like to ask Allah , begin to segment and categorize these items. Group like items with each other. You should be left with a list of high-level categories with the detailed items beneath it. Having an organized list will help you visualize and remember your list, so that when you make your du’a to Allah you will be prepared, knowing exactly what you desire and being efficient in your supplications.Also, be sure to include some of the du’as that were commonly recited by Rasullulah . This is a very simple, yet powerful du’a. One of the beautiful names of Allah is Al-Afuw, the One Who Pardons your sins and Removes them from your record (as if you never committed them). Allah loves to pardon so ask Him for your pardon. He loves to forgive those who sin and ask for their forgiveness. During these last ten nights, use the opportunity to become closer to kalam-Allah (the speech of Allah). Reflect and ponder over its meaning. Read what the scholars of Tafseer and the Ulema have commented on the Qur’an and try to derive lessons that you can immediately implement into your daily life. Rasullulah said, “Whoever stands (in qiyaam) in (the night of) Laylatul Qadr out of faith and expectation (of Allah’s reward), will have all of his previous sins forgiven” [Al-Bukhari and Muslim]. As much as we plan on striving to increase our ibadaat during these nights, it’s important to refrain from those actions which displease Allah . Minimize idle conversations and actions which take you away from the remembrance of Allah. Rasullulah was well known to be generous – but he was especially generous during the month of Ramadan. Aim to be charitable during these nights, whether you donate your time, your effort in volunteering or just being kind to your fellow Muslims. There are many things you can do to realize the blessings of this merciful night. Encourage your family members to join in on the search for Laylatul-Qadr. The magnitude of this night demands our effort and sacrifice. Nabeel Nasir is the Marketing Lead at Qabeelat Majd, the Toronto branch of AlMaghrib Institute (http://www.almaghrib.org/) . He is also the Managing Director of Bahiya Collections, a womnen’s online fashion store (http://www.bahiyacollections.com/).